WRENCH enables novel avenues for scientific workflow use, research, development, and education in the context of large-scale scientific computations and data analyses. WRENCH is an open-source library for developing simulators. 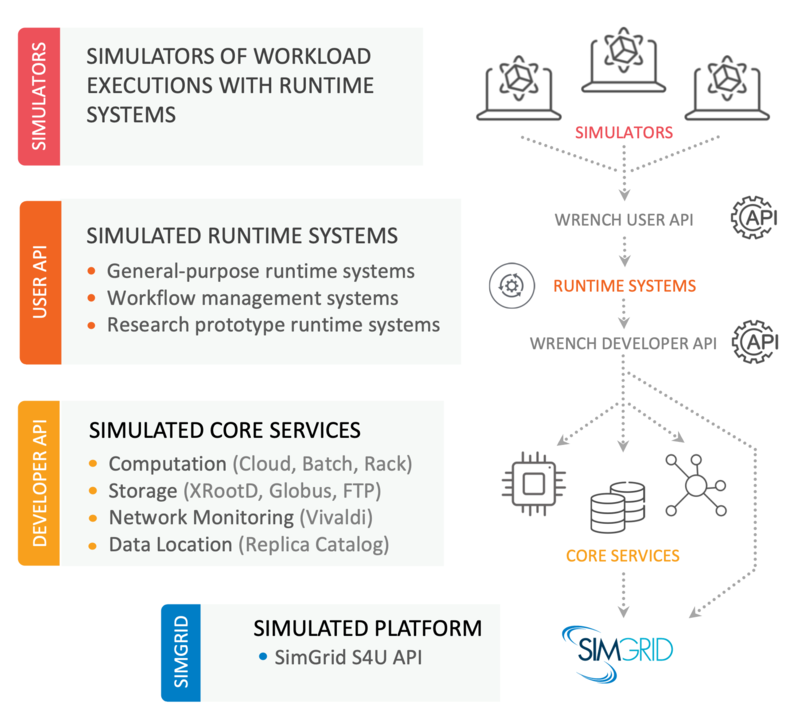 WRENCH exposes several high-level simulation abstractions to provide high-level building blocks for developing custom simulators. WRENCH provides a software framework that makes it possible to simulate large-scale hypothetical scenarios quickly and accurately on a single computer, obviating the need for expensive and time-consuming trial and error experiments. WRENCH enables scientists to make quick and informed choices when executing their workflows, software developers to implement more efficient software infrastructures to support workflows, and researchers to develop novel efficient algorithms to be embedded within these software infrastructures. 2019 International Conference on Computational Science (ICCS), 2019. 13th Workshop on Workflows in Support of Large-Scale Science (WORKS’18), 2018. DOI: 10.1109/WORKS.2018.00013. © 2017-2019 WRENCH. All Rights Reserved. and the National Center for Scientific Research (CNRS) under grant number PICS07239.